CH-47F Chinook helicopter had completed the first flight of Chinook helicopters in July, 2018. 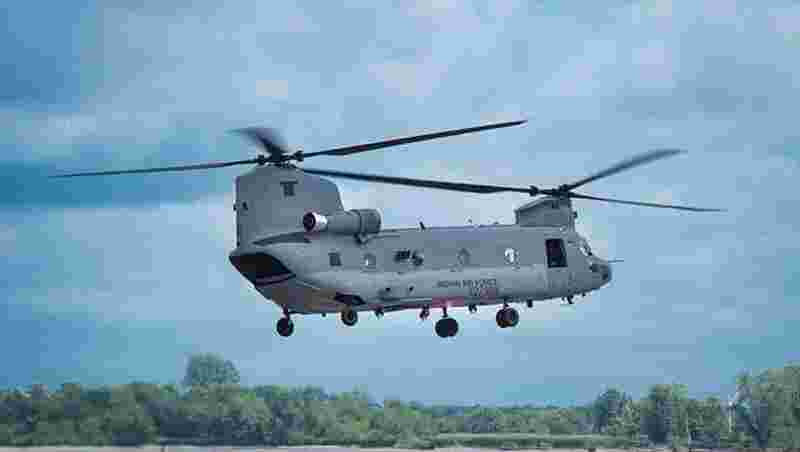 Defence Ministry had ordered Boeing for 15 CH-47F Chinook heavy-lift helicopters. Indian Air Force (IAF) has received its first Chinook heavy-lift helicopter on February 10 which arrived at the Mundra port in Gujarat. The helicopter is partially Made-in-India. The American aerospace major Boeing will be building 14 more such helicopters in collaboration with Tata Advanced Systems. The Chinook has now reached Chandigarh and will be inducted into the Indian Air Force later this year. The helicopter had completed the first flight of Chinook helicopters in July, 2018. The CH-47 Chinook is an advanced multi-mission helicopter that will provide the Indian Air Force with unmatched strategic airlift capability across the full spectrum of combat and humanitarian missions. The Chinook has unsurpassed ability to deliver heavy payloads to high altitudes and is eminently suitable for operations in the high Himalayas. "The aircraft has been battle-tested in diverse, extreme conditions throughout the world, and has proven capability to operate in the wide range of conditions that typify the Indian subcontinent," said Boeing. Boeing said that the CH-47F Chinook is an advanced multi-mission helicopter for the US Army and international defense forces. "It contains a fully integrated, digital cockpit management system, Common Aviation Architecture Cockpit and advanced cargo-handling capabilities that complement the aircraft's mission performance and handling characteristics," it said. Boeing has announced the arrival of the first four CH-47F (I) Chinooks for the Indian Air Force on February 10. "Through its current partnerships with Indian Air Force and Indian Navy, Boeing has ensured a high rate of mission readiness and increased operational capabilities," said the company. 1. Advance Digital Cockpit: It gives the pilot more information on their surroundings and advanced autopilot capabilities. 2. Flight Control System: The Digital Automatic Flight Control system will allow pilots to hover over a place even with limited visibility like thick smog or brownouts/dust-storm. 3. Modern Airframe: The modern airframe increases stability and improves the survivability of the aircraft. 4. Advance Cargo handling: The Chinook cargo system can work either sling-loaded or internally in the aircraft. 5. Maximum Speed: The aircraft has a maximum speed of 302 km/h and a cruise speed of 291 km/h. 6. Mission Radius: The Chinooks can operate in the radius of 370.4km. 7. Weight: The gross weight of the aircraft is 22,680 kg and useful load limit is 10,886 kg. Defence Ministry had ordered Boeing for 15 CH-47F Chinook heavy-lift helicopters. Boeing will also help in training and support required for the helicopters. The helicopter will enhance India's capabilities in military and humanitarian missions.